On Wednesday 27 March, Intercomm held a public consultation on an anti-hate crime initiative. The event in The Duncairn Centre for Culture & Arts centre attracted scores of people who are active in organisations that support victims of hate crime or are engaged in anti-hate crime initiatives. It was a consultation event to raise awareness of hate crime and to pick a logo that will spearhead the campaign. 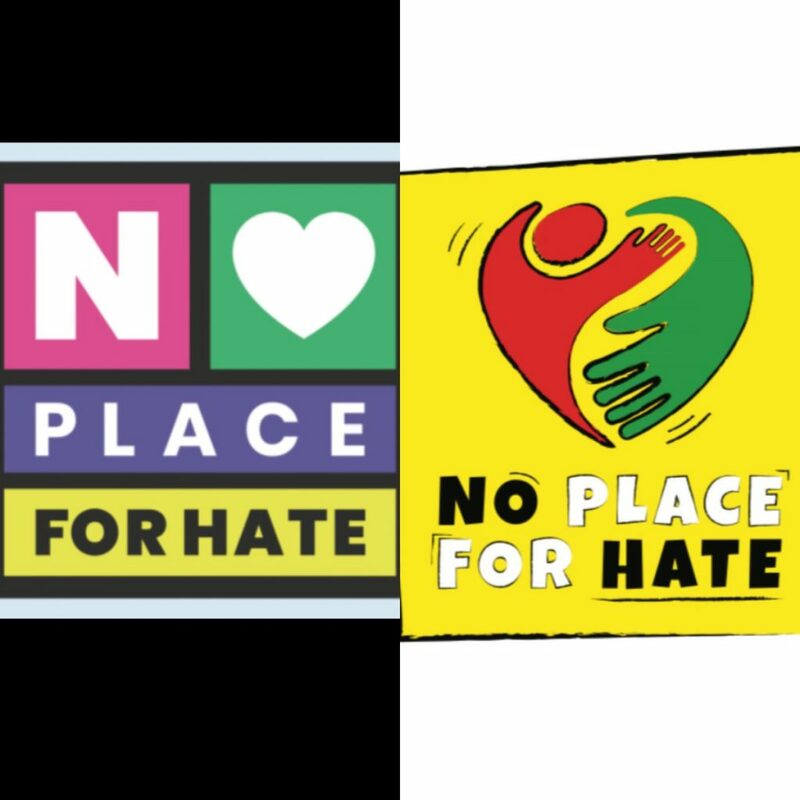 The campaign slogan in #NoPlaceforHate. Gordie Walker spoke to many of the representatives for the podcast including Debbie Walters vice-chair of Northern Ireland Policing Board and Director of Northern Ireland Alternatives and Chief Inspector Kelly Moore of PSNI at Tenant’s Street. And True Vision a police funded web site designed to provide you with information about hate crime including homophobic, transphobic, racial, religious and disability. They can be contacted through their website, too. This is the last podcast in this series, but the Between The Lines podcast will return soon. The podcast is supported by The Executive Office and the Community Relations Council. In this episode of Between The Lines, Leanne Marshall talks to three women who work with communities and families in north Belfast. Geraldine O’Kane works in Whitewell Community Surgery, Maria McCaffery is with the Star Neighbourhood Centre, and Joan Totten North Belfast Alternatives. This is the third episode of Between the Lines podcast with Gordie Walker. Margaret Duffy from Newington Housing talks about the problems of Universal Credit and its effect on residents. Work and Pensions Secretary, Amber Rudd recently said that there was a direct link between the increased use of food banks and problems with the roll out the Universal Credit benefits scheme. As you’ll recall from our first episode, we spoke with Newington Housing Association. During this discussion, Conor was told by Margaret Duffy about how seriously this affected some of their tenants in the mouth of Christmas – and some of the lengths they had to go to assist single mothers and others in much need of their help. Conor Maskey met Margaret, Antony and Martin from Newington Housing. We follow up with youth workers from North Belfast who have just returned from a study visit of Manchester and Liverpool looking at the development of youth hubs. At the start of January, 14 youth workers from North Belfast travelled to Manchester and Liverpool to look at youth work practice, buildings and services including super centres in Manchester and Liverpool. Gordie Walker met up with them in Artillery youth club to find out what they made of it. Ray Giffin from Duncairn Arts talks to us about Super Sundays and how Arts, Music and creativity are helping to create a shared safe space for North Belfast. Duncairn Centre for Culture and Arts in North Belfast is on the lower Antrim Road and once a fully functioning place of worship. The church has seen its share of good times and bad times and when the congregation numbers slipped, The Rev Bill Shaw and his committee came up with a new vision for the church building. The building is now home to some community orgs and has a thriving programme of arts and cultural events. Gordie spoke to Ray Griffin the Arts and Events Manager about Super Sundays. Music this time comes from Conor Caldwell renowned composer and traditional fiddle player. North Belfast native, Conor Caldwell is a composer, fiddle player and researcher of Irish Traditional Music. Conor took the small number of steps around the corner from his Rosemount Gardens home to the Between The Lines Studio to chat with us about his love for North Belfast and some of our city’s interesting, historical and significant inks to traditional music. We were delighted that he brought his fiddle along too and gave us a taste of one of his own compositions. The production team were Leanne Marshall, Conor Maskey Cairan Shannon, Davy Sims and Gordie Walker. This is the second episode of the between the lines podcast with Gordie Walker. The response to episode one has been very positive, and we are delighted with the number of downloads and the listening figures. People have been listening from all over Ireland, UK, the USA and even China. Massive thanks from me and the whole team here at Between the Lines and a shout-out to our listeners in Shenyang. Segregation barriers collectively referred to as ‘Peace Walls’ have blighted the landscape of North Belfast for almost 50 years. Many of these structures that were erected primarily to protect people and property, have now become redundant. Kate Clark, Gerry O’Reilly and others have been working with local residents in the Duncairn area for a number of years to get them to a point where they are ready to contemplate barrier removal or transformation. Kate and Gerry discuss the changes to two of these structures – the complete removal of one in North Queen Street and the physical transformation of another on Duncairn Gardens. Conor Maskey from Intercomm talks to Sarah Lorimer, Coordinator of the Imagine Peace Walls Project, about the research she has carried out around the history of just some of the barriers that separate people in the North of the City. Davy Treatment songwriter musician and performer. Davy has played with the Peace Frog and others but now performs with his reworked version of Shock Treatment, Shock Treatment 21. Davy has been in and around the Northern Ireland music scene for decades and we ask him along to the studio for a chat and a song Davy is the second visitor to the BLTcast studio and he brought his guitar. There’s more about Shock Treatment on their Facebook Page and Davy’s Facebook page is here. Shock Treatment‘s Davy McLarnon is our musical guest on this week’s episode of Between the Lines Podcast. Conor Maskey caught Davy on playin in our studio. Poetry from the docks this week, too with John Campbell. Podcast available from lunchtime Friday 8 February. Newington Housing Association formed in 1975. 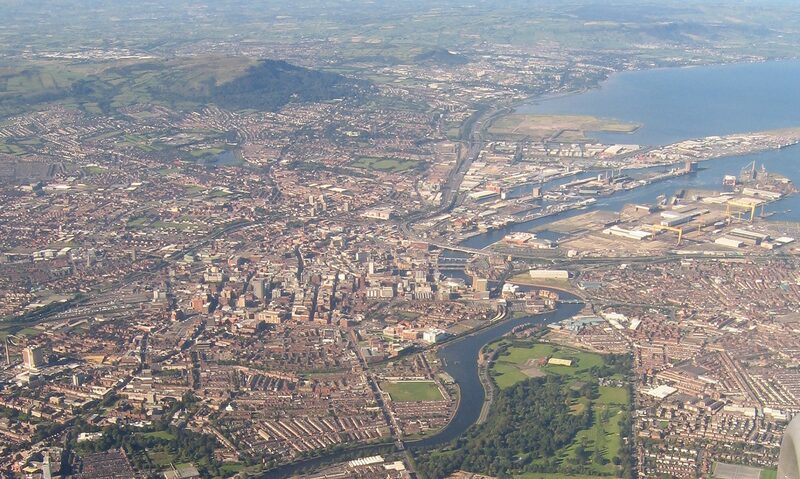 It manages nearly 700 homes in mainly Interface areas in North Belfast. As times have changed so too has Newington, broadening its role from simply meeting immediate housing needs, to meeting wider community needs and taking brave steps towards transforming and regenerating communities and resolving interface issues. Anthony Kerr from Newington Housing reflects on their work in reducing and confronting anti-social behaviour (ASB) and looks at how social and economic pressures are affecting their tenants. As part of Intercomm’s Shared History programme Dr Eamon Phoenix invited 25 people from Ardoyne and Woodvale to talk about Belfast history. Among the places they visited were Rosemary Street Presbyterian Church and, were Gordie caught up with them, at Queens University. Ciarán Shannon from Duncairn Community Partnership (DCP) takes with time Leanne Marshall to reflect on his life experiences before during and following the conflict. There’s music from Joby Fox, writer, musician, and performer. Joby has played with the Bank Robbers going on to perform with Bap Kennedy in Energy Orchard and pen the song Belfast. He was signed to EMI and was based in London always pushing the limits and sticking up for his home town. His new album is about to be released and the song I Love you will be available on 14th February Joby is the first visitor to the BLTcast studio and he brought his guitar. Gordie Walker and Davy Sims. As we begin recording the first Between The Lines podcast the legendary singer/songwriter/performer/entertainer and well known man about town Joby Fox dropped by to record a song for us. You can hear Joby’s performance on Between The Lines episode 1 launched on 25 January 2019. The Between The Lines podcast launches soon. For people who are championing change. The podcast is a place to stimulate discussion and debate. And it will be used for everyone taking positive steps to transform their community.